SIGforum.com Main Page SIG Pistols .357 Revolver recommendation? How about something very different. An FN Herstal (their only revolver) It shoots fantastic and it’s super beefy on par with a S&W N frame. Made for them by Astra, IIRC. Do you have the parts to be able to convert to 9mm? When I was looking for a .357 revolver a few years ago, the one that blew my skirt up was the new S&W 66. I'm a big Ruger fan, but the midsized S&W frame fit me like a glove and I liked the satin silver finish with the black accents. I would recommend one of these. I don't have the 9mm conversion. Would be cool to have but the pistol is tough enough to find by itself. I would compare a S&W to a Porsche and a Ruger to Hum Vee. While the Ruger is not as refined as the S&W it is an excellent functional revolver and very durable. Either one is a good choice. 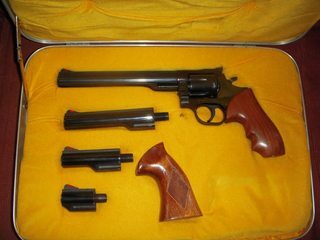 I owned and was issued S&W revolvers. You can't beat a Model 19, 66 or 686 (6 rds, no lock). I also had a few blued and stainless Pythons but they're priced into another league now. Opinions will vary on the manufacturer but the KIMBER K6S in 2" (and now a 3") might be something to consider. No exposed hammer, absolutely butter smooth DAO trigger and all stainless construction. The stainless can be ordered in brushed, polished or black DLC coating. Six rounds and not that much wider than a RUGER SP101 or S&W J-frame. I just got a 2" DC version and was amazed at how well it shoots even with full load .357magnum rounds. The SS 2" looks nice...but can you actually fire full load .357 mag. out of the "worlds lightest production .357 mag. six shot" without wincing? Even gold dot .38 special +P is a bit snappy out of a small revolver. 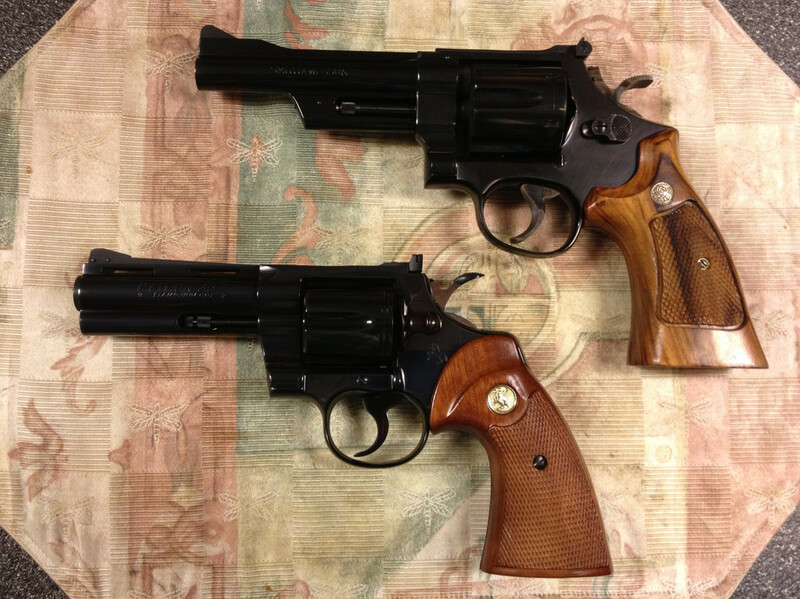 I could recommend either the Ruger GP models or the S&W 586/686 class of revolvers. Another that crosses my mind, more of a choice to not follow the herd, would be the Dan Wesson model 15. Although no longer in production, you'll get style points with some nifty features from the man who was in charge of the quality control during their golden years, and the other half of S&W's namesake - Daniel B Wesson. Interchangeable barrels and a great overall build quality. Easy to work on, adjust, and premium features like the old-school deep bluing, vent-ribbed barrel shrouds, and recessed cylinders make them a diamond in the rough. Ruger recently started making a few models of the redhawk in 357mag again. One of those would be pretty cool. Lots of great recommendations here, I must say I’m a Ruger GP100 fan. It’s just all-round, a great, robust, trustworthy, pistol!! If price is no object, find a S&W Performance Shop from the late 90s and early 2000s. Oh...you mean one of these babies! Well on that higher end of the scale, "Price is not a factor, he just wants quality. ", there are the Manhurins and Korths too! Cant go wrong with a GP100. Python is a superb but pricey and used , revolver. LOVE my Dan Wesson 715 .... not cheap but not crazy expensive . Different. Tunable. Interesting. Not common. Accurate and well built. Can be had with multiple barrels. I'll admit that I'm a Ruger whore. However, I'm surprised there aren't any recommendations for a S&W R8 in this thread. I'm tempted to make that my first S&W revolver. It seems like the perfect blending of old-school meets badass. a year later I got a GP-100 in stainless, four inch. He was disappointed that I got a 4", but I purchased it to carry , daily. three shooting sessions later , I was out shooting him , both with .38 spec. and .357 mags. If you want a strong 357 mag, price not a problem. Freedom Arms, model 83 or 97. 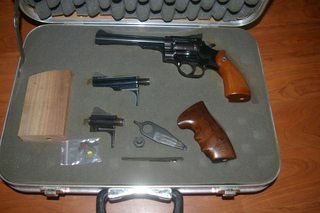 For a 357 revolver, I have them by Colt, Smith & Ruger. And they all have made some really nice revolvers. 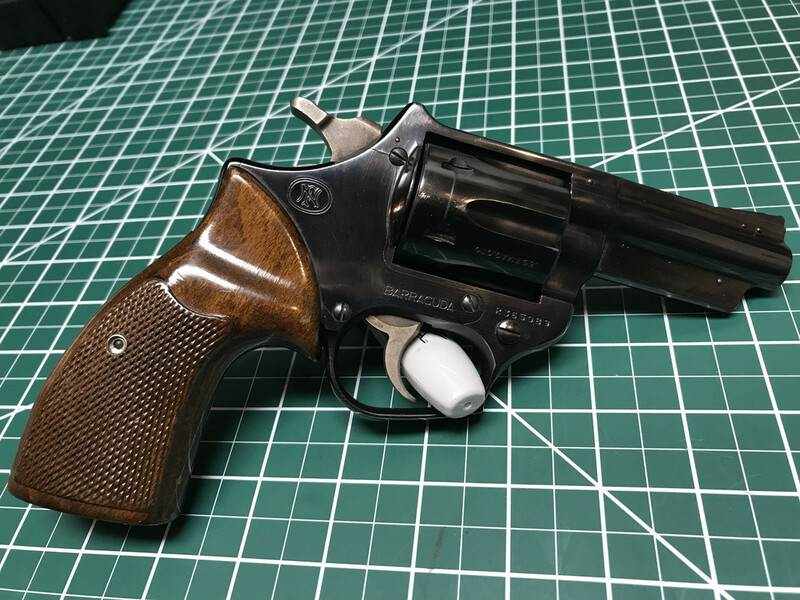 My favorite of all is a pre-lock S&W PC 627 5" 8 shot. The trigger is excellent, I changed the front sight to a fiber optic, it is one great shooting revolver. The Dan Wesson is always a nice choice. If you can find one, the Mahurin 73 is a sweet shooter. A batch came in a bit ago that had a lot of cosmetic wear but they are great shooters. Of course I have my Python and a batch of Smiths to play with as well. Oh, and almost forgot the Rhino, it's a fun shooter as well. The GP100 is a pretty nice firearm right out of the box. I do like my 3" and 5" models. Quick Reply to: .357 Revolver recommendation?